On Computers » DUDE, WHERE’S MY BAG? We still remember the time an airline company rang our doorbell at 3 a.m.to deliver our lost bags. At least we were home, not at a computer show where we might be forced to wear Hawaiian shirts and flip-flops. Now there’s a gadget aimed at preventing all lost bags. 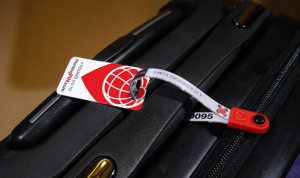 You can also put a HomingPIN label on a cell phone, laptop, camera or passport. If left behind, the finder can find you by going online to homingpin.com. Then — should they choose to accept the assignment — they can send you a text message to come and get your stuff. They don’t see your address or other personal information. The HomingPIN five-piece starter pack, with one loop and tag, one key ring and four stickers, is $10. It comes with a 12-month subscription, after which you pay $8 a year to cover 30 items. Whatever you do, experts advise, don’t hand-write your personal information on luggage tags anymore. That can lead to identity theft or to criminals tracing you to your home while you’re on vacation.